Well, my friends, my newest novel, Cold as Winter Woods, was published last week, but problems were discovered inside the book and the book had to be removed from sale for a few days until the problems were fixed. Now, the NEW and UPDATED novel is once again available for sale on Amazon! You can pick up the nice thick Paperback for just $9.40. However, if you prefer to carry your library around in your Kindle, you can do that too: the Kindle eBook will set you back 99c (yeah, only 99 cents! ), unless you’re part of Kindle Unlimited–then you’ll pay nothing! That’s nil, zilch, zero! If you bought the PAPERBACK before Monday, August 13, 2018, you received the “problematic” version, but *I* will personally REPLACE it for FREE (obviously, for FREE!) with the corrected and updated paperback novel! Just contact me here and I’ll tell you where to send your original sales receipt. NOTE: If you have NOT bought the paperback yet, though, go on over to Amazon and order it. I am not selling my book–Amazon is–I can only send you a replacement Paperback for the “bad” copy you purchased before August 13, in exchange for your original sales receipt. If you purchased the EBOOK before Monday, August 13, 2018, it is the “problematic” version. You can get the corrected and updated eBook by signing into your Amazon account, looking into your list of Kindle eBooks by clicking on your “Content & Devices,” and completely DELETING the eBook copy of Cold as Winter Woods that you bought before August 15. Deleting will allow you to re-order the updated eBook (NOTE: because of the types of corrections that were made to the eBook, YOU WILL NOT RECEIVE AN AUTOMATIC UPDATE ALERT FOR THIS EBOOK ON YOUR KINDLE). Finally, order the eBook once more. Then you will have the new and updated eBook! And please feel free to contact me here and I will gladly reimburse you for the first 99c you paid, in exchange for your original sales receipt. I spent many hours interviewing law enforcement in the writing of this novel. I wanted to get my facts straight and the men and women of the New York State patrol, undercover, and detective divisions were there to talk to me and to answer my innumerable questions. They gave up precious time helping me get police procedures straight as well as checking over specific sections of my manuscript for accuracy–long before I was able to finally type THE END. 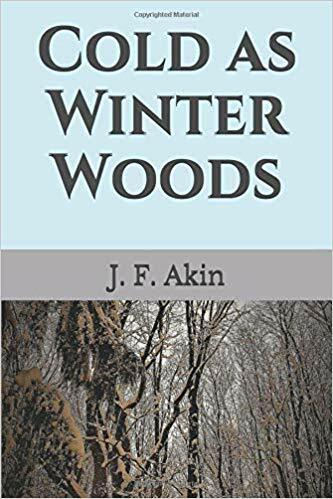 So head over to Amazon.com, pick up the thriller Cold as Winter Woods by J.F. Akin, and find the answers to those questions! Be sure to leave me a positive comment or some “stars” on Amazon if you like the story. Writing a novel is hard work, as many of you know, and encouragement from fellow writers and faithful readers means a lot! Thank you!